McKinsey & Company is a global management consulting firm. It conducts high level analysis to evaluate an improve management practices for organizations across public, private, and social sectors. This report evaluates the causes and consequences of gender disparities in the work place, incorporating both the public and the private sector. It comprehensively examines female representation in corporate management positions, executive boards, parliament, and governmental cabinets across the African continent. It also analyses the barriers that prevent women from climbing the corporate latter and securing politically significant positions in government. Research on this topic is critical because achieving gender equality is crucial to the sustainable development and health of businesses and governing bodies. Time and time again, studies have confirmed that giving women more decision-making power and providing women with more equitable opportunities for career advancement is essential to the overall health of any organization, government, or society at large. This report explains that increasing the number of women in leadership positions helps businesses and governing bodies gain higher financial returns, improve their risk management capabilities, and ameliorate their overall decision-making processes. Furthermore, this publication emphasizes how gender equality cannot be solely based on numbers, and how true gender diversity reform needs to be rooted in accountability and collective behavioral changes. Women in leadership say that they had to be tough and resilient to achieve their current status, and that they need to work continuously harder than men in order to get recognition for their work and influence their surroundings. This demonstrates that hiring more women is not enough to transform the gender dynamics in the work place—corporations and governing bodies need to be accountable for their collective attitudes towards women and actively work to disintegrate barriers blocking women from rising to leadership positions. 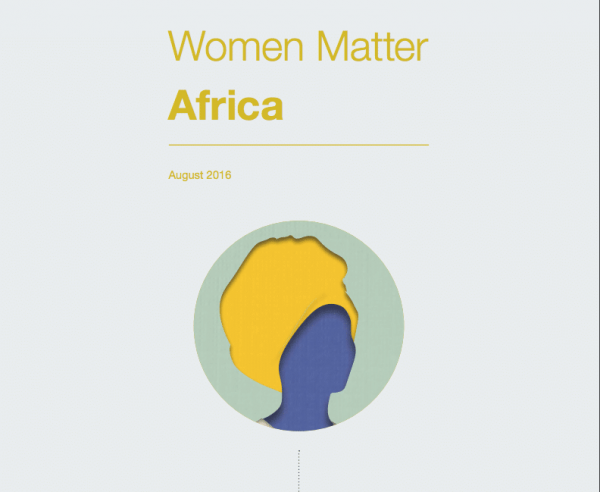 Lastly, this report draws its analysis from a dynamic set of sources, including interviews with 35 African women in leadership roles, surveys conducted at 55 corporations, data on female cabinet and parliamentary appointments, financial performance analyses of 210 publicly traded African companies, and peer-reviewed publications regarding gender disparities in the work place. This compelling mix of sources gives a well-rounded, complete perspective on gender diversity in African leadership. African countries have made a considerable amount of progress regarding women in leadership over the past decades. African corporations have more women in leadership roles than the worldwide average, and the number of women parliamentarians in African governments has doubled over the past 15 years. However, the vast majority of African governments and companies have not achieved anything close to gender equality, and therefore are missing out the lucrative benefits provided by gender diverse leadership. To highlight just one of these benefits, African companies in the top quartile in terms of number of women on their executive boards have an earnings before interest and tax (EBIT) margin that is on average a fifth higher than the industry average. This demonstrates how companies with more women in leadership positions are more financially successful, therefore African companies would benefit from creating a more gender-inclusive work environment. 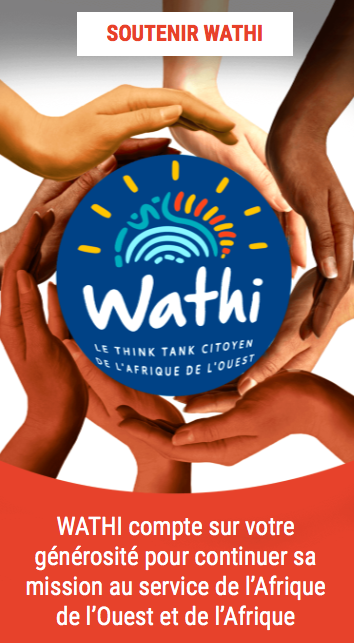 The countries in the WATHI zone can gain a lot from these findings, because West Africa is lagging significantly behind the continental average for women in leadership roles. Women only represent 11% of people on corporate executive boards in West Africa, compared with an average of 14% across the continent. Additionally, West Africa has the lowest female parliamentary representation in the continent, with just 16% of parliamentary seats filled by women. Lastly, 61% of women who hold governmental cabinet positions in West Africa lead social-welfare portfolios that garner limited political influence, rather than leading ministries such as treasury, infrastructure, defense, and foreign affairs with more political influence. This demonstrates that, even when West African women do obtain a leadership role in government, they are not given responsibility over politically significant and revenue-generating functions. Therefore, it can be argued that even increasing the number of women in West African government leadership does not necessarily lead to a fair distribution of power. Research shows that companies with a greater share of women on their boards of directors and executive committees tend to perform better financially. African companies are no different; this report found that the earnings before interest and taxes (EBIT) margin of those with at least a quarter share of women on their boards was on average 20 percent higher than the industry average. In the private sector, Africa has more women in executive committee, CEO, and board roles in companies than the average worldwide… Yet women are still under-represented at every level of the corporate ladder – non-management and middle and senior management – and fall in number the higher they climb. Only 5 percent of women make it to the very top. In government, the number of women parliamentarians has almost doubled over the past 15 years and the number of women in cabinet has grown fivefold in 35 years. Again, numbers vary considerably, this time by country and region. Southern and East Africa are ahead of the pack, but there is room for improvement even here. In global terms, Africa has more women in parliament and cabinet than the average. Credit for this growth may go in large part to targets for women’s representation set by parliaments and political parties. Representation, however, still needs to double if Africa is to achieve gender equality. Numbers do not equal influence. Although the number of women in leadership positions may have risen, women do not necessarily have greater power. In the private sector, more than half of senior women occupy staff roles rather than the line roles from which promotion to CEO typically comes. In the public sector, approximately half of women cabinet ministers hold social welfare portfolios, with arguably limited political influence, that do not open doors to top leadership roles. Indeed, the increase in women’s share of cabinet roles appears to come more from the creation of new social welfare portfolios than from any real redistribution of power. Our research suggests that many African organizations do not take gender issues seriously enough, with only one in three companies in the private sector citing gender diversity as a CEO priority. Today’s women leaders have succeeded, it seems, largely through a combination of opportunity and drive rather than through a coordinated corporate effort to promote gender diversity. And organizations do not always understand the obstacles women face. For example, the women leaders we interviewed cited attitudes to women in the workplace as their number one challenge, whereas organizations gave this much less importance. Make gender diversity a top board and CEO priority. Senior leaders should develop and enforce a cohesive gender diversity transformation strategy, own the communication about this transformation, monitor progress and lead the change. Anchor gender diversity strategies in a compelling business case. Communicate the business case simply and clearly so that employees understand how to link their individual interests to the success of a gender diversity transformation program. Confront limiting attitudes toward women in the workplace. Address unconscious bias by educating all employees and reviewing and changing processes (for example, recruitment and performance reviews) to make decision-making more objective; include men in gender diversity transformation initiatives; conduct surveys to understand what the limiting attitudes are. Women are outnumbered by men not just at the senior management and board levels but at every stage of the African corporate pipeline. Moreover, their representation diminishes as they move along that pipeline – an important consideration if today’s women in non-management positions are to rise to become tomorrow’s senior managers. In the 55 companies in our survey, women make up 45 percent of the workforce but receive just 36 percent of promotions. There is a substantial pay gap between men and women holding senior positions in private sector companies – arguably another indicator of women’s lack of influence. More than 50 percent of African women cabinet ministers are in charge of social welfare portfolios, while only 30 percent lead the ministries for treasury, infrastructure, defense, and foreign affairs – arguably departments with more political influence. As important as social welfare portfolios are, they do not oversee revenue-generating resources or decide how revenue should be allocated. In addition, social welfare portfolios do not tend to prepare the incumbents sufficiently for appointment to head of state or other senior political roles. It is also worth noting that the ratio of women with social welfare portfolios to other functions has not changed in the past 25 years, a period in which new social welfare portfolios have been created. This, rather than a real distribution of power, might account for the higher number of women in cabinet. Gender issues are not taken seriously enough. In Africa, only one in three CEOs has gender diversity on his or her agenda. The barriers women face in the workplace are poorly understood. Organizations do not share women leaders’ view of the impediments to their success. Programs to redress the gender balance do not tackle the right issues. Lack of understanding of the reasons for women’s under-representation means efforts to tackle it can miss their target. Organizations and women leaders in Africa have different views on the main barriers to more women taking on more senior positions. Organizational representatives see the “double burden” syndrome, whereby working women also have to take primary responsibility for domestic duties, as the biggest barrier to their success. Women see this as an issue too, but say the most important barrier is attitudes in the workplace that result in women being treated differently from men. Organizations give this considerably less recognition.